I have no complaints. She was punctual, friendly and professional with our guests and Very Very good. She was one of the highlights of our wedding. Everyone went on and on about how well she captured them. I recommend Jessica and cannot wait to hire her again. Jessica was great! Everyone loved the caricatures she was creating. There was always a line of people waiting to get their picture drawn. She was very friendly and fast! I'm in love with my caricature that she drew of my husband and I. Jessica is great to work with and I would definitely book her again for another event. Jessica was super friendly, managed time well and the guests kept going back for more. Everyone thought she was great. Got there early to set up and had no issues whatsoever. Very professional. Highly recommend her. Jessica worked my daughters first birthday party and was great with all the kids. She was very friendly and easy going. She has an amazing artistic ability and I would highly recommend her! 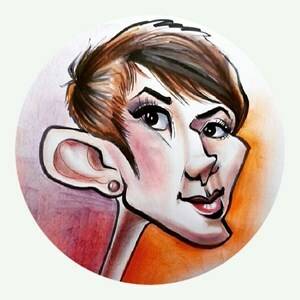 It was a pleasure having Jessica as our cartoonist.. She was prompt.. sweet, talented and very accomodating. I would strongly recommend her ..
Jessica was GREAT! She was professional and her work was extremely Fantastic! I would definitely recommend Jessica's services to anyone and I will be using her services again in the near future. Jessica is a treasure. We booked her for our son's 1st birthday party and she was a major hit with the children and the adults. Everyone kept asking where we found her, she was so professional, polite and engaging. Prior to the party we would bounce e-mails back and forth and I was stunned by her quick and swift responses. We ended up having some of the children return for additional portraits of their favorite characters (ninja turtles, Dora the Explorer/ magicians). She is awesome! Jessica was a friendly, wonderful and professional artist. She made the children in my event feel at ease and comfortable. I would highly recommend her for any event and hope to use her again for another occasion. Thank you gig master for your recommendation!